Do the SNP see England as a foreign country already? The Yes to Independence campaign has called for neither campaign to accept donations over £500 from outside of Scotland. Are the SNP now already seeing England as a foreign country? That’s the question we should be asking, following calls from the Yes to Independence Campaign that neither they nor the pro-union camp should accept donations of more than £500 from outside of Scotland. “There is evidence to suggest that most people in Scotland do feel quite strongly that the referendum campaign should be determined by the people who live in Scotland and who are going to make this decision. “So what we said was we will not accept donations above £500 from anyone who was not a voter, who is not on the electoral register in Scotland, and I think that is a very important thing in terms of making sure that it is the people who are taking the decision in Scotland who are contributing to the campaign. Jenkins’ remarks were somewhat ill timed though. As he went on about avoiding money from outside Scotland seeking to influence the outcome of the referendum, the SNP found a politician from outside the country doing the very same thing. Using a guest article in the Scotsman, Plaid Cymru Leader, Leanne Wood has called for a new Britain based on the idea of a “neighbourhood of nations”. “The truth is that the current political union has passed its expiry date. It’s time for a 21st century redraft, as the SNP has argued, a new social union that marks a new era where differences are respected but collaboration can flourish on the basis of equality and partnership. “Scotland and Wales, Celtic nations both, border a single country, a millennium and a half of interaction which has shaped our respective cultures like no other. England is not just a neighbour to us. She is our sister nation too. “Feeling Welsh or Scottish has never been dependent on the existence of a Welsh or of a Scottish state. In precisely the same way, people’s sense of Britishness does not need a British state to sustain it. “The concept of Britain has proven itself to be as adaptable in the past as it should be in the future. With independence, a new Britain can begin to emerge. “My nation’s journey on the constitutional path may not immediately mirror the Scottish experience, but within these islands, different countries enjoying differing forms of self-government are not unusual. “The British-Irish Council – our version of the Nordic countries’ collaborative forum – is already acting as a laboratory of innovation, from plastic-bag taxes to minimum alcohol pricing. In a new age of equality, this co-operation can be extended to more issues, from climate change to broadcasting. Alex Salmond meanwhile appears to be on collision course with Westminster over the question of a second option on the ballot paper in the 2014 referendum. With Westminster and all of the UK’s main political parties set against any idea of “devo-max” being an option at the vote, the Sunday Herald as got hold of material suggesting Salmond is hardening his position in favour of a second option. “There’s a view abroad in Scotland that perhaps it would be better from where we are now – where we now control about 16% of Scotland’s revenue base, that rather than become an independent country, at least in the first stage, that that fiscal base should increase to something near 100%, and that’s often called devo max or fiscal autonomy. And it’s a very attractive argument, incidentally. “It has a major problem and that is that the UK government, while they respect the right and the ability of Scots to decide on independence, are not prepared to accept the right of the Scottish people to decide on devo max. They say that devo max should not be on the ballot paper. My position is a bit different from that. 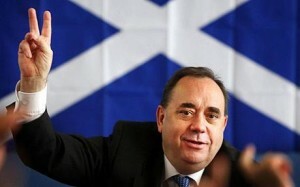 Whilst opponents have argued that this suggests the SNP are frightened that they will lose a straight yes or no to independence question and see devo-max as a face saving option, recent polling by Ipsos Mori has shown that while 27% of people supported Scotland becoming an independent nation with 29% supporting it staying in the Union, 41% said that they preferred the idea of devo-plus or max. For the Better Together campaign, it might be political expedient to argue that the SNP advocating a second option on the ballot paper is political face saving, but with public feelings so strongly in favour of the devo-plus style idea, a positive vision for the future development of Scottish devolution is now vital to embracing the positive campaign called for by Alistair Darling just last week. I’m already getting fed up with this, and Miliband and his passport childish remarks. lets get on get the referendum done and get on with fighting the dam Tories. At present, funding for the NO campaign comes predominantly from right wing groups in England. That is especially embarrassing for Labour in the NO campaign because they are now seen to be a mere front for Tory money. I’ve read this a couple of times, and I still don’t understand what the point is? How does leanne wood’s meditations of a new view of Britishness contradict anything Blair Jenkins said? Independence is for Scotland to decide. It is up to the Scottish people to vote if to leave the UK or remain within it (Devo max is a different matter). I think politicans elected outside Scotland should keep out of the debate! The Unionists have to offer and explain what DevoPlus or Max will mean to the people of Scotland. Devo Max whatever is a Unionist piece of kite flying that has to be articulated, but can’t be as long as they are saying Vote No. The Westminster Government has to come up with a Devo whatever solution to their dilemma. It’s doubtful if they will. It plays into our hands. Scottish people will react against any hint of right wing donors trying to influence the debate. The referendum will be won and I will get my wish of never having to live under a Tory government again. I’m finding it a little difficult to spot any connection between Blair Jenkins highlighting the obvious problem of a “No” campaign almost entirely funded by donations from outside Scotland and the comments quoted from Leanne Wood. Just when you thought that the worst had come to pass with Darling fronting the ‘no’ campaign, here’s Richard Baker. Of course funding for the Scottish refeendum should come form Scotland; anything else is just plain wrong. Scotish Labour (and the Scottish tories and the Scottish glib-dumbs) should easily be able to match whatver the gants (and the greens and the SSP) can raise, but even if they can’t, money is not everything in campaigning. A major cost will be orgainsing an HQ, I’d be astonished if there was no Scottish busines or Trade Union willing to lend a building for the purpose. Also…what exactly is wrong with a referendum between independence and a properly-articulated ‘devo-max’? There should be no difficulty in designing a devo package that reflects what the majority of the people actually want; hardly anyone wants the devolution staus quo – in fact even fewer peole want that than want the end of the Scottish parliament. You don’t appear to know much about Scottish politics I’d suggest. 1. The referendum will be won by those who believe in co-operation not division. 2. If you believe you would never have Tory government in an independent Scotland you are wrong. I also take it from your comment that some of the high-profile backers of the SNP won’t be donating to the Yes campaign and trying to influence the debate? Here’s a proposition for you. Why don’t the supporters of independence put forward all the varying degrees of independence? Why don’t we have about 30 options on the ballot? People will vote between Devolution and Independence NOT Shades of Devolution and Shades of Independence. The only way to save the union, if it is not too late, is to have a federalised union, with Wales, Scotland and the English regions all having powerful law making parliaments with wide ranging powers. The current set up is still very unstable. Devolution was a good idea, but it needed to go further. There is no problem in the No Campaign being funded by sources outside of Scotland. The SNP accepted money from “tax exile” Sean Connery until the law prevented it. I reckon it’s you that doesn’t know much about Scottish politics if you think the Tories would come to power in Scotland! I agree. Let’s NOT give the people a choice! After all, isn’t that what Westminster wants? Exactly! If the Bitter Together crew think that they’ll win the debate on the back of Tory grandees and their funding, by god, they’ve got it wrong! Again! Whats the point of having a referendum and ignoring the result? The people of the NE of England rejected an elected NE England Assembly. Why persist with it? Polls consistently show we English want our own English Parliament and many of us want English independence. We don’t want regional assemblies!! If Scotland did separate from the rest of the UK the SNP would break up also and then their members would split along left/right lines. Many would go to the right and many to the left. Now the name Tory might not be there but the policies of a new independent Scottish right of centre party would be Tory. Even if a left of centre party (Labour) were to win the first few elections people would get fed up of the same government and they would eventually kick them out. Who would take their place I wonder? Where did I sday give no choice? I’m saying you should start advocating different hues of independence so we can have every option given to the people. Wait… that isn’t practical is it? No what we should do is give people the option of devolution or independence. Your attempts to paint this as some Westminster conspiracy show up the poverty in your argument. If you don’t have anything useful to say……..
Well, that’s democracy, I guess. I wouldn’t be happy, but hey, in a democratic Scotland, I would have to accept it. Do you accept the right of peole who do not share your views across the UK at present to vote in as Tory government though? I don’t want the Tories in power in the UK or Scotland but we have them in both Westminster and Holyrood. I’m glad you accept my point that an independent Scotland would NOT be immune from Tory goverments at Holyrood. You have no idea about Scottish politics. The Tories were voted into power in Westminster by the English electorate. There is one Scottish Tory MWP. The Tories are not in power in Scotland. They are, however, sharing aplatform with their soulmates, Labour, in order to try and keep the Scottish people in thrall to London. You obviously haven’t heard of the Tartan Tories. Whilst conservative in their morals, they have decided to vote SNP just for independence. They are unlikely to continue to vote for the SNP if independence is achieved.